A moderator on the official Disney Infinity boards recently posted to reveal that the development team "is currently focusing on the traditional gaming platforms." They added that there are "no plans for further updates to the Apple TV version of the game." The news means that future figurines released for the Disney Infinity platform will not be compatible with the Apple TV version of the game. The announcement was first spotted by TouchArcade. 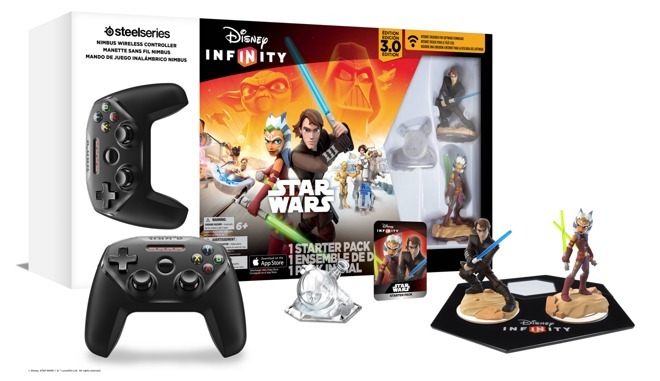 The news is especially surprising as just last November, Apple began selling a Disney Infinity starter kit, bundled with a fourth-generation Apple TV and SteelSeries Nimbus controller, in its retail stores. At the time, Disney boasted that it was offering "the complete Disney Infinity 3.0 experience," meaning parity with traditional game consoles like Sony's PlayStation and Microsoft's Xbox. Going forward, however, that won't be the case anymore. And users on the official Disney Infinity boards didn't take the news well. "They made it out to be on a par with at least the older console versions such as PS3 in their descriptions," user "Thoric Frosthammer" wrote. "That encouraged people to invest hundreds of dollars in the platform who otherwise would not have, if they knew they'd eventually have to buy a PS4 to continue playing." The Disney Infinity platform features both software and hardware components, relying on a base to "scan in" figurines that can then be used in the game. Figurines are available in individual packs, but the Apple TV starter pack came with two "Star Wars" figurines, along with a play set.